Brecon/Aberhonddu TownBrecon, or Aberhonddu as it is known in Welsh, is an historic market town in the heart of the Brecon Beacons National Park. The hills around Brecon boast some of the finest walking and mountaineering terrain in Britain, including Pen-y-Fan, the highest point in southern Britain at 886m. 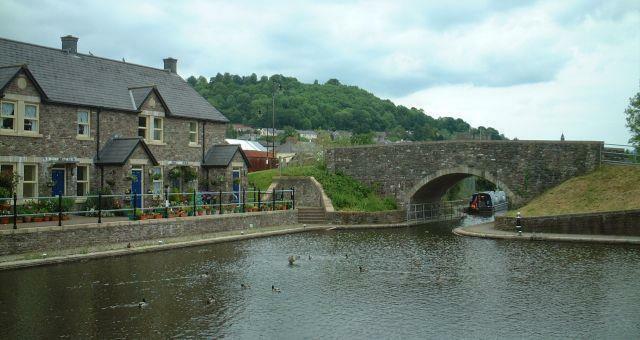 Brecon Canal Basin is at the northern extent of the navigable section of the Monmouthshire & Brecon Canal, right in the heart of Brecon. The canal towpath offers walkers a gentle walking experience through some very pretty countryside and to enjoy the waterside wildlife. Brecon is the starting point of the Taff Trail, a 55 mile walking and cycling route that follows the Taff river right down to Cardiff. Ancient Britons, Romans and Normans have each left their mark on Brecon. 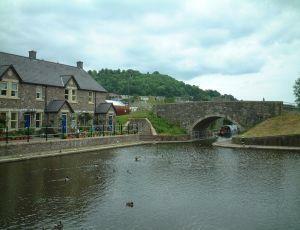 The town's name comes from that of the old Welsh name of the kingdom - Brycheiniog' in whose territory Brecon stands. The kingdom took its name from Prince Brychan who founded it, and who remains a colourful character in local folklore and legend. The name later became anglicised to Brecknockshire or Breconshire. Brecon, or Aberhonddu as it is known in Welsh, is an historic market town in the heart of the Brecon Beacons National Park. The hills around Brecon boast some of the finest walking and mountaineering terrain in Britain, including Pen-y-Fan, the highest point in southern Britain at 886m.